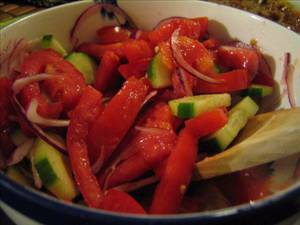 Juicy tomato salad with cucumbers and onions. Peel and slice cucumbers into coins. Add vinegar and water and mix well. 389 members have added this recipe to their cookbook. I agree with both orchid_lover and aery.There is no way one could have all that in one serving not to mention the protein and fat.Did you add chicken or fish and oil and forgot to put it in the recipe. skeptic! Question? Confused. Did anyone ever get a response on the Nutrition Facts of this recipe? Why is it so high in caloric value, fat, etc.? I don't think the numbers add up...I eat something like this and it doesn't go off the scale like these facts...could someone help me with an answer? If it's true I need to rethink some things. I gotta agree with orchid_lover fat and protein? what? it looks like it would be zero points to me. i don't get it. where's the fat & protein come from? I think you need to adjust your servings, there's no way 6 tomatoes and 4 cucumbers is one serving! Otherwise, this is excellent for WW! This is a great phase 1 recipe! Cucumber, red onion, oil and vinegar salad. There are 306 calories in 1 serving of Tomato Salad. Calorie break-down: 8% fat, 76% carbs, 16% protein.